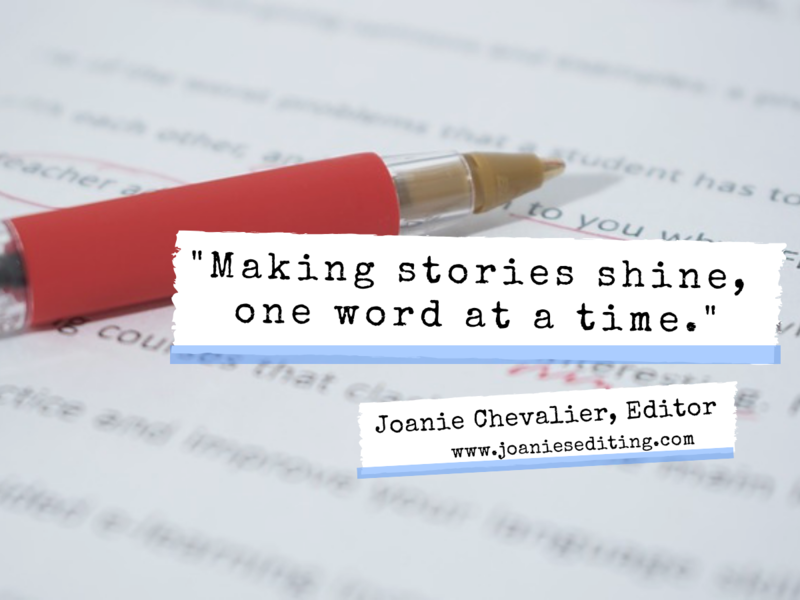 Joanie Chevalier, Content Editor – Making stories shine, one word at a time. I offer affordable editing and beta reading services. See the editing tab for more information. See the testimonial page for added confidence in my services. I can edit any story, but my specialty is what I enjoy reading: suspense, horror, crime, psychological, non-fiction, and a good short story. I would love to connect, so give me a shout any time. You will find all of my contact information at the contact tab. A little bit more about me: I worked as a legal assistant for about 30 years. In 2014, I started writing and then began editing, and I received my first clients after posting on Fiverr. For about three years, it was Fiverr and word of mouth. After clients started returning for their next projects, and receiving top reviews, I became braver and branched out. I took a year-long copyediting course and gradually built my editing business. Then, in April 2018, the worldwide law firm where I worked decided to downsize without layoffs and offered their legal assistants a buy-out. I nearly jumped out of my seat right then and there to sign the contract. This was the opportunity for me to get away from a box (an office inside a highrise), do what I really wanted to do (editing and running my own business), and being out in nature and sunshine. I loved camping and I’ve always felt like myself being outdoors. After I walked out of that building for the last time, I immediately bought a Class C RV, sold and gave away almost everything, and started driving. I now live on the road full-time with my two fur babies, Frankie & Lily (Chihuahua rescues). I am also Co-Founder of a magazine, The RAC (Reader/Author Connection) Magazine. If you love short stories, book reviews, author interviews, puzzles, and much more, check out The RAC Magazine! Finally, I am an indie author. See my books at my Amazon Author Page.